10 pairs of Socks for ONLY £2 at House of Fraser! You're welcome! I think it's a good deal considering the quality you pay for. These are £5 on sale in the store. Thanks, are they also available in-store @ Sports Direct, as closer? theyre doing these offers to make money from buy & collect. 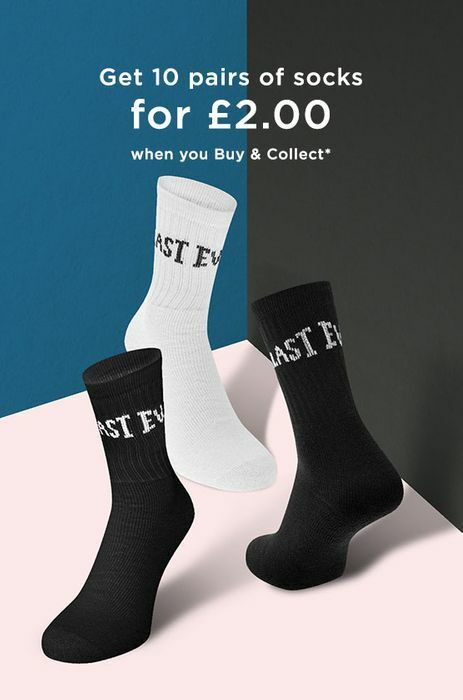 It won’t be costing them anything to ship people’s orders to stores along with their deliveries and then you’re forced to spend at least £5 instore to make buying the socks worth it. I agree. Really tempted by some good deals, but will not pay for C&C. Bad enough that get credit note for returns in this day and age. Clearly it's a marketing strategy, but still a great deal nonetheless. It's £4.99 even for 'click and collect' if your local store doesn't offer "collect plus"!!!! It's a good offer but paying for the posting is a bit ridiculous for every single item. I got the suitcase but I think I will miss this deal. Looks like HoF have gone downhill since Mike Ashley bought it. Instead of a luxury shop with top of the range brands its turned into Sports Direct. Same deals, same stuff. Wow this is a great price. Will check this out soon! If you check the details, you get all the informations you need. Reporting deals for nothing is actually not nice! Never reported a deal mearly asked for you to change the title!! ?